Broadcast on Channel 5 (UK) 17 April 1997 Thurs 4:40 a.m.
One confusing incident in this episode is Franky writing a letter to Karen . Is she supposed to be able to write but not to read? Or has Karen done such a good job teaching her in such a short time? Some of the "jazz" playing on Miss McBride's windup gramophone is of a much later vintage than the 78 era: distinctly "cool" in fact, with prominent vibraphone. Greg rushes to help Lynn and manages to staunch the bleeding until she can be taken to hospital. Erica's niece Barbara is brought to Wentworth for drug smuggling : she tells her she ought to keep quiet about who she is if she values her safety. Barbara naively ignores Erica's advice and brags to the women that Erica will help her get out as she is her aunt. Jean is appalled by the news about Lynn and blames herself for not noticing Lynn's state of mind. Bea presses Barbara to see if she can persuade Erica to have the rec room TV replaced. Over dinner at Meg's, Jean shifts the blame to Steve. Bea tells Karen her story: she claimed at her trial to have hit [not strangled as in the flashback in (200)] her husband's girlfriend in a fit of temper after an argument rather than as the premeditated act it was to get herself a lighter sentence. It was at the beach where he caught her husband ("John" in this version, not the "Harry" of episode (2)...) behind the sheds carrying on with an ex-colleague of hers. While Bea was inside, her daughter Debbie got into drugs and eventually died of an overdose. Bea was not even allowed to go to the funeral. 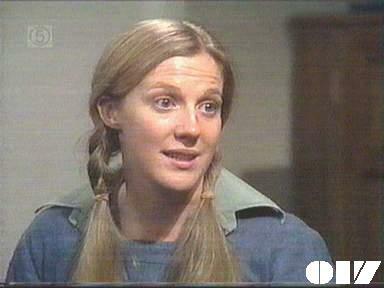 Bea jokingly warns Officer Manson not to discipline Barbara as the Governor has ordered she is to be treated differently. Barbara gets a dressing down from Erica then lies to Bea about taking full responsibility (whereas she'd actually dobbed in both Bea and Monica). Barbara gets Lizzie to tell her the details of a similar set-up Bea and Monnie had carried out against another officer years ago. Jean confronts Steve with the news of Lynn's suicide attempt but he shrugs it off and refuses to accept any responsibility for it. Barbara passes the information she learnt from Lizzie on to Erica to try to get in her good books again and Erica warns her about the prisoners' usual attitude to "laggers". Erica questions Bea, Monica and Doreen about their previous frame-up on an officer called Miss Watson. Erica decides to move Monica out of Bea's cell to avoid them cooking up any other plans and to reinstate Vera immediately. Miss McBride celebrates her 71st birthday and wants a party, but Franky and Doreen have no-one to invite. Steve sees some potential witnesses for Karen's retrial: her husband's girlfriend and her doctor. The latter is more help, revealing that Karen was pregnant when she came to see him and is shocked that she is no longer so, as he cannot believe she would have had an abortion. Vera demands that Meg should tell her who talked so that she could get her job back: Meg nods across the rec room to indicate Barbara. Greg confirms to Steve that Karen wanted children so much that she would never have had an abortion. Karen reluctantly agrees to tell Steve the whole story and tells him that she only had an abortion after her husband demanded she had one and beat her until she agreed. Mrs McBride gets a rare visit from her nephew Trevor: he recognizes Franky and Doreen and sneaks out into the hallway to call the police. Franky and Doreen bundle Trevor into a cupboard and go on the run again.